When you are in the midst of your wedding planning, we know how stressful it can be to do so much research. You need an insiders perspective and who better than experienced wedding photographers?. With so many websites today using headlines with the words “Top” & Best,” it’s hard to spot the differences between advertorial and editorial. Then there are the wedding directory sites that offer free and paid listings to anyone that wants submit to them. Our personal experience has helped us compile a list of vendors, artists and service providers that we have successfully and happily worked with over the years. Since we've seen their work up close and personal, we can share our insights with you! It's important for you to know how these people came to be on our list. That lets you know how much you can trust it and how subjective or objective it is. Here is how we went through our process. Wedding Day Schedules - Smart wedding planners compile a list of everyone working your wedding including company name, the day of contacts, phone numbers, and e-mails. That allows everyone to have easy access to each other during your event. So if someone isn't on our list, that doesn't mean they can't do a great job for you, simply it means that since we haven't had the opportunity to see them personally in action, they didn't make the list. We established criteria that looked beyond how happy the brides and grooms were at the end of their wedding. We also looked at how good these vendors are at problem-solving on the fly. What is their demeanor and how well do they listen to their bride's desires. Working With Others: The number one factor that is important to us is how well they work together to make day smoother. Are they all pulling on the same team to make your day successful or simply focused on themselves? It's important to consider the Big Picture. Working Wedding Vendors - There people are working regularly throughout the year on many different weddings and events in DFW and beyond. There are others who work only occasionally. We've found that the people who are busiest also are the most efficient at getting things done. Problem Solvers - These professionals do their best to maintain a "Drama" free zone surrounding your wedding day. It's no secret that during a live event something may not go according to plan. Much of the hard work they do is never seen publically because it all happens behind-the-scenes. That's how it should be. Socially Savvy - There is a growing movement to spend more time broadcasting your event on Social Media than being present in your moment. There is nothing wrong with privately posting a picture on Instagram and updating your Facebook during a meal break or after your room set-up. It's when people get on their phones instead of watching the pulse of the event and anticipating needs for you and your guests that it becomes a problem. Note: Discuss ahead of time the posting of pictures to social media by vendors. Your private event is a representation of their work. You can establish with them what you feel comfortable broadcast publically. After narrowing down our list, we reflected on the quality of their work. Timing: The people on this list understand the importance of timing and how it affects your wedding day. Should things run behind, something has to give, and good wedding vendors know how to estimate how long it will take to do something and stick to it. The most creative person in the world who can't finish on time will cause you undue stress and missed opportunities on your wedding day. Creativity: Not every wedding is looking for something out of the box. The adage of "Do something creative" typically means show me something I've seen before only with a twist. There is nothing wrong with Timeless, Classic and Themed receptions. There are exceptions. Some modern couples are looking for something truly reflective of their personalities, tastes and desires. You want to know that these vendors possess a range of talents and not just one look, style or trick up their sleeve. Consistency: Do they execute on a regular basis at a high level? Consistency is part of professionalism, and quality is reflected in it as well. Pricing: Value can be measured in many ways, one of which is the cost. We don't personally know the pricing for all of these companies and individuals, nor is it as important to us because price and value are subjective. What is inexpensive to one can be expensive to another, so we kept it out of our evaluation. Real value can be shown by how talented, creative, timely, attentive, professional and responsive they are to your needs and desires. Popularity: We did not look at their online reviews or marketing and advertising because we base our on personal experience. It's so easy to buy followers and earn likes these days, and ultimately they are considered vanity metrics. They aren't an accurate gauge of performance on your wedding day just how efficient or focused they are on creating a buzz about their business. Creating a buzz is critical to the success or failure of the industry and is not a bad thing at all for raising awareness. Some are the special people who made our family members’ wedding days so perfect. We want to be very transparent about this, so it helps you in your evaluation. You might consider the reasons why we chose them to be a part of our own special day. We’ve noted who those particular people are using an asterisk*. These different individuals and companies do not work for us, do not pay us to be on our list, and are carefully considered before we include them. It’s up to you to do your research, however, read their reviews, and come to your own conclusions. Be wary of anyone in the wedding industry who is more interested in turning your wedding vision into theirs than delivering your own vision of that beautiful day. It’s indeed appropriate to remind them that you established your budget, will provide the vision, and control the publicity or privacy of your affair. Once you have a shortlist, meet with them in person, and make sure they answer all your questions to your complete satisfaction. You will quickly tell who has the heart to listen and a spirit of kindness. You may not be someone’s biggest customer, but your wedding has to be important to them. These people love to design, plan, and organize your wedding and often refer to themselves as planners, coordinators, designers or specialists. They typically have a team of people who deliver full-service planning, event design, a-la-carte planning, and day of coordination. Even as your date approaches, you can frequently scale their services to take things off of your plate. They are always happy to talk to you about their services and why using them will help you have an incredible wedding experience. You may ask yourself why to hire a wedding planner when your Church or Reception site provides one. Think of your planner as your personal advocate. The on-site director manages their staff and team behind the scenes. Your planner is working to make your wishes known and overseas the bigger picture than just one location. 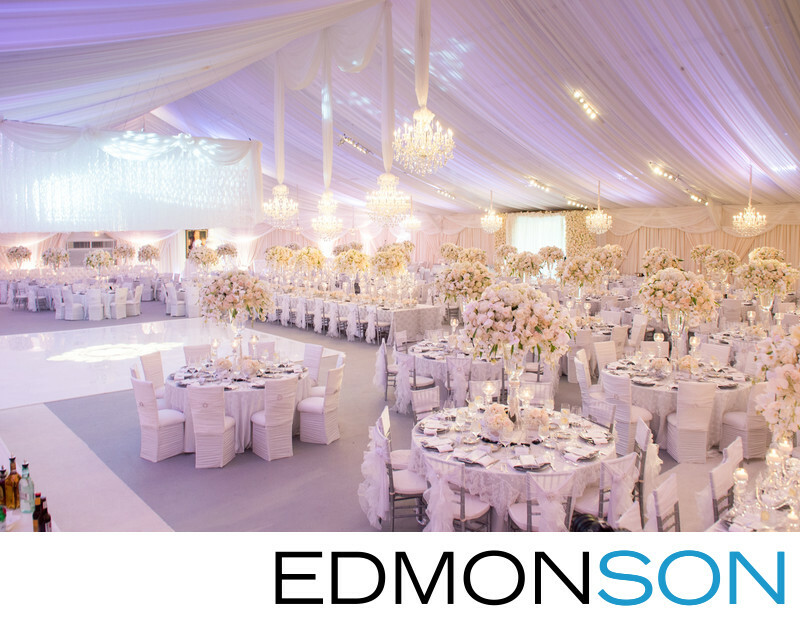 Venue planners typically are familiar with what they have seen done before in their space when it comes to room arrangements and decor. Wedding planners may have a broader perspective and bring new and fresh ideas to the table or represent your wishes for something never seen before. Within the Dallas Indian and South Asian community, these names are well known. Unless you want to teach someone all of the distinct differences in a Hindu ceremony, and then explain the difference between a Garba and a Sangeet, you should check out these talented individuals. They understand and are sensitive to the nuances of event timing within the community. The Indian Wedding Timelines and Understanding Indian Weddings articles contain even more helpful information. There are Stylists, and then there are Artists. The number one problem that can put your wedding day off schedule is Hair and Make-up running late. Just because someone is a friend or is good at these needs doesn’t mean they know how to perform under pressure. There are very few people we know who not only are the best at what they do but also understand the big picture. Surely you don’t want to walk down the aisle without looking your best. You might also have want to get a picture with your grandmother or bridesmaids, but couldn’t because you were running behind. These are the people we trust ourselves when we have photo shoots and unique needs. Doing a test run before the wedding is something we also highly recommend. It's a worthwhile expense to include in your planning. It is not unusual to hire your Hair & Makeup team for your entire day. That way they can be with you for any touchups after emotional moments or quickly change your hair before your reception. Check out the Wedding Hair and Makeup Best Practices article with even more useful information. Matching your videographer’s attitude with his/her approach is critical for us to do our best work for you. These people understand the nuances of working together as a team. Photographers and videographers should not be in competition when serving you. It’s important for both of us to work together to make your day visually successful and also be sensitive to your desires and needs. Your experience is better when we take turns directing you. While similar, they are different mediums. The best approach is to spend time with your photographer and then trade-off to spend quality time with your videographer in the lead. When looking at potential videographers, we suggest turning off the sound when watching their demo videos. If you still like what you see, then when the sound is on, you will like it even more. Turning off the sound allows you to look more precisely at the style, camera movements, and editing and makes deciding that much easier. Nothing makes a wedding more visually stunning than astounding flowers. Check out our tips on bouquets, boutonnieres, and centerpieces to learn more ways to avoid common mistakes. The florists on our list consistently show excellence in their work and creativity. As a cornerstone of how your wedding day will look photographically, a great florist is worth its weight and more in gold. For those looking to turn the ordinary into the extraordinary, look no further than the creative genius that is Nelson. He starts with your vision, and then his sketches transform your ideas into a concept. His experienced and very talented crew builds, delivers, constructs, and tears down the kinds of fantastic events you often see on TV. He’s the not-so-secret weapon that countless brides and coordinators call upon to make something out of nothing. His full-service design and fabrication company will take your event from concept to completion. His talents are legendary. As an artist, he's attention to detail is also superb. In the vast state of Texas, there are only four names to turn to for the best Indian wedding decor. Prashe brings with her an incredible sense of Fusion and Fashion while Suman Pai and Alpa offer the latest in contemporary and traditional decor. Fabulous lighting visually makes the difference between just okay and great. If you are having a ballroom wedding, it’s crucial you involve us in your lighting plans if you want to ensure it's done right. For your reception, professional lighting from up lights to pin spotting directs the eye and transforms the room. It also provides depth and dimensionality to your photography. Truly, it is one of the cheapest expenses for your wedding, but it will make the biggest difference in your guest experience. One of the most frequent comments you’ll hear after an event is that people had “Fun.” There are very few wedding DJ’s we would recommend for a classy affair (Andy Austin) or big fat Indian wedding (DJ Riz). Both are best in class and are at the top of their games. Most of the time, the vibrant sound of live music will bring warmth and richness to your affair getting everyone on their feet. While many bands bring energy, not all understand how to get their sound right. Music that is too loud during dinner can stop your guests from enjoying themselves and make them ready to leave. Most bands will invite you to see them in live action. As an expert wedding photographers, we can always spot the new people at the receptions, hugging a wall and trying to blend in. After a few laughs, they suddenly relax, knowing it’s okay for them to be there for a few minutes to listen. The followingis the specific wedding bands & DJ's we'd suggest.